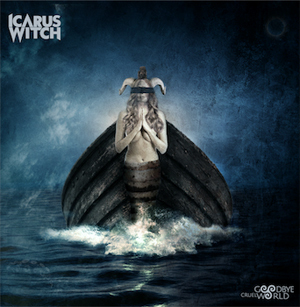 Pittsburgh heavy metal band ICARUS WITCH has announced plans to release their 6th record, Goodbye Cruel World, on October 26th with Cleopatra Records. The upcoming record marks the band’s first new record in 6 years and first to feature new vocalist Andrew D’Cagna. Today, the band has debuted the record’s new song “Misfortune Teller”, and you can check it out below. You’ll get what’s coming to you, you are your own misfortune teller"
Nearly a decade and half after their formation, ICARUS WITCH has never sounded so vital. The band’s reinvigorated sound can be traced back to Myers’ move to Salem, MA and brief sabbatical, reconnecting with his witchcraft roots where he found inspiration and song ideas. Meanwhile, guitarist Quinn Lukas continued writing music back in Pittsburgh. After returning to the Steel City, Myers regrouped with Lukas and the pair demoed their new material for a year before enlisting the vocal talents of Andrew D’Cagna (BRIMSTONE COVEN, IRONFLAME) who rounded out the band’s current lineup. The band hired drummer Jon Rice (BEHEMOTH, SKELETONWITCH) to provide the record’s pummeling percussion. Finally, with the assistance of Pittsburgh extreme metal wunderkind Shane Mayer engineering and some valuable pre-production notes from legendary producer, Neil Kernon (QUEENSRYCHE, JUDAS PRIEST) the band tracked the album in early 2018. Mixing duties were given to rising studio star, Atlanta-based Brad Cox and the record was mastered in Sweden by Erik Martensson, of melodic rock gods ECLIPSE. ICARUS WITCH will be performing a hometown album release show Saturday, October 27 7PM - 11PM at Get Hip Record store (1800 Columbus Ave Ste 40, Pittsburgh, Pennsylvania 15233).